This week my friend Susan of Permanent Posies and I get to go check out Christmas in Cowtown which opens on Thursday! I can’t wait! I always LOVE hanging out with Susan, she’s a long time friend and confidant and she and her hubby have always been there for us and given us the best advice! So, when we get to have time together I am always thrilled – and when we can go to things like this – we have a great time! 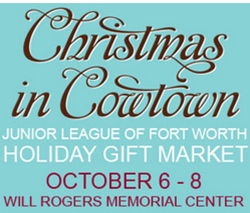 Christmas in Cowtown is at the Will Rogers Memorial Center in Fort Worth. It is a Holiday Gift Market put on by the Junior League of Fort Worth. 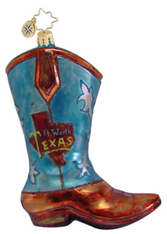 Christmas in Cowtown Holiday Gift Market is a juried show of more than 130 carefully selected exhibitors in a beautifully decorated and holiday-themed setting. Merchants from across the country represent a wide range of product categories including home décor, wall art and accessories, antiques, seasonal items, jewelry, children’s products, clothing and more. Cocktails in Cowtown Preview Party On Wednesday, October 5, 2011 from 6 p.m. to 9 p.m., the Christmas in Cowtown Holiday Gift Market will open with an evening kick-off party featuring private shopping, heavy hors d’oeuvres, and cocktails. Complimentary parking and porter service is provided. Tickets are $50 per guest. 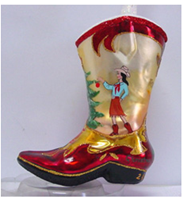 These Boots Were Made For Shopping Ladies Lunch On Thursday, October 6, 2011, Christmas in Cowtown Holiday Gift Market will host a lunch event. Private shopping will be offered to lunch guests from 9 a.m. to 11 a.m., followed by a buffet lunch. Complimentary parking and porter service is provided. Tickets are $75 per guest. These are 2 very cute Christmas Ornaments and they are for sale! You can click on either picture to order yours! If you are planning on attending you can pick them up there, or have them shipped! I have never attended and I am so excited about it. I can’t believe the holidays will be here before you know it and I can’t wait to see all the great gift ideas! Ticket prices are $10 per guest. A three-day shopping pass can be purchased for $15 per guest. There is no charge for children 5 and under. I will definitely be taking tons of pictures to share with you, so make sure to check back to see those and hear about what a great time I am sure we will have had!